With the addition of a chain breaker, Fix It Stick now offers almost every tool you’d need on a ride. Fix It Sticks utilizes two interlocking metal drivers to form a T-handle. At each end of the wrench, there’s room for a different bit. 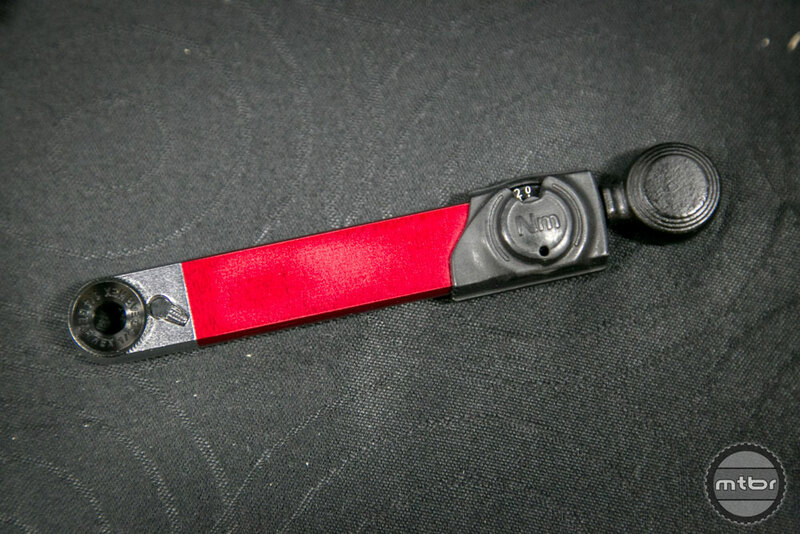 To expand the product’s versatility, they added a number of additional bike-specific tools, including a 15mm axle nut wrench and tire levers. Their latest addition is a chain breaker, which connects to the Fix It Sticks to form a handle and lever. The chain breaker is available separately, but you can also receive one as part of Fix It’s new MTB kit. The kit includes tire levers, the chain breaker, Fix it Sticks, extra bits, and a nice carrying case. Price is $49. For more info, check our coverage here. The Truing Tool mounts to your frame or fork via elastic bands. 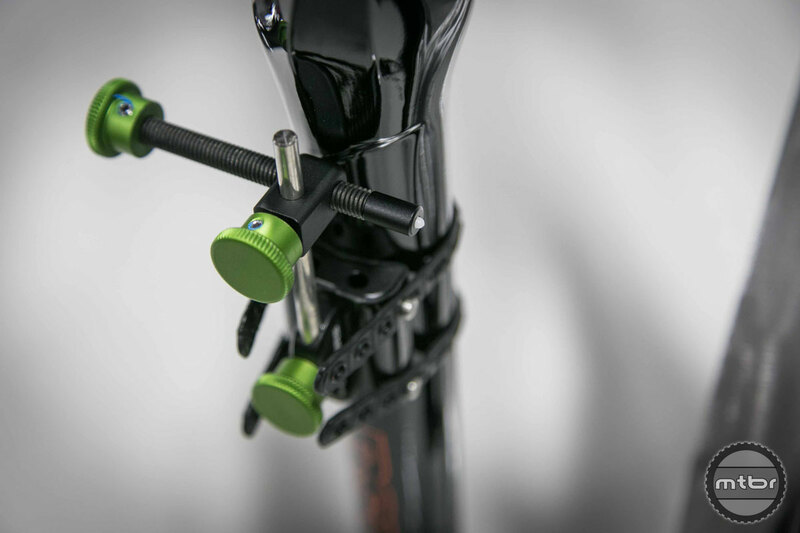 A series of adjustable arms allows you to position the truing arms. While nothing beats the convenience of a work bench mounted truing tool, not everyone has that kind of space. 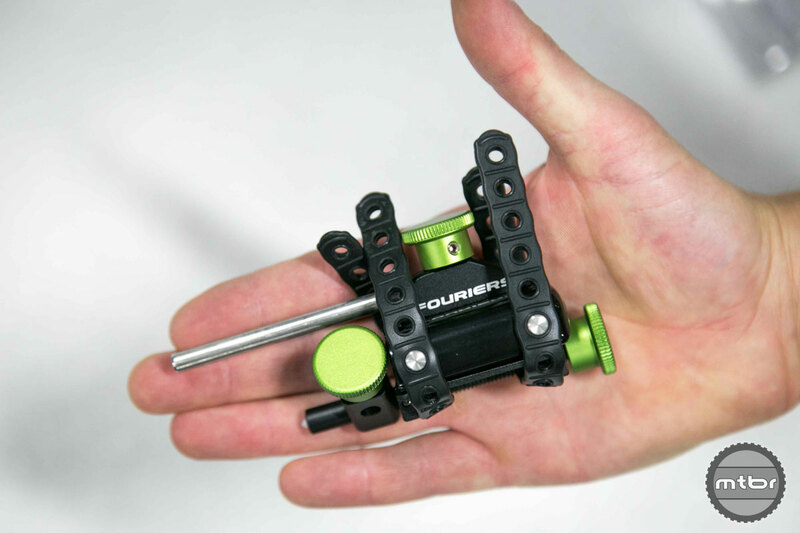 Fourier’s new Quick Portable Truing Tool fits in the palm of your hand, but can be easily connected to your frame or fork for repairs. When bundled up for storage, this tool is small enough to fit in the palm of your hand. Pricing has yet to be announced, but this svelte tool could be a handy addition to any trunk based repair kit. The Pro head is an upgrade to Lezyne’s classic chuck. It makes swapping between valves simpler and also incorporates a valve core removal tool. 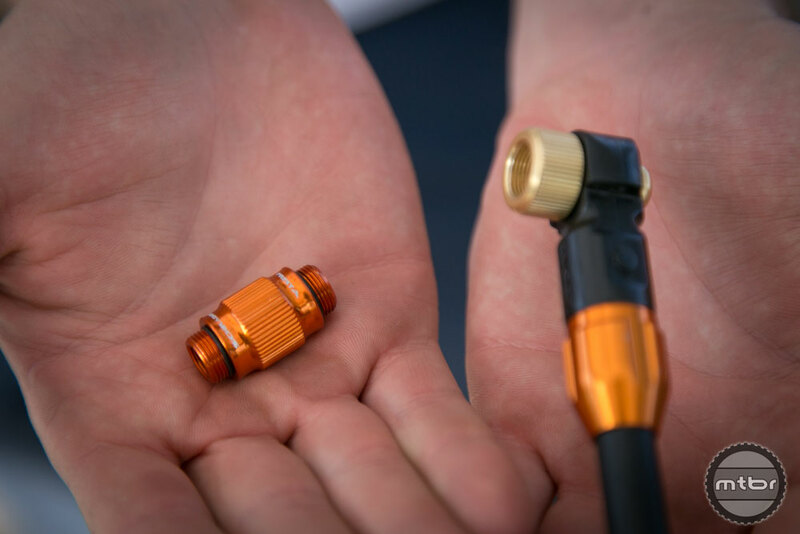 While we’re big fans of Lezyne’s quick connect head (read the Mtbr review here), not everyone is a fan. For riders who prefer the classic Flip-Thread Chuck, Lezyne now offers an upgraded version. This head is easier to convert between Presta and Schrader valves. It also incorporates a valve-core wrench to help make tubeless set up a little simpler. The head is available in both high-volume and high-pressure versions. It’s compatible with existing pumps and retails for $18. To learn more, visit www.lezyne.com. 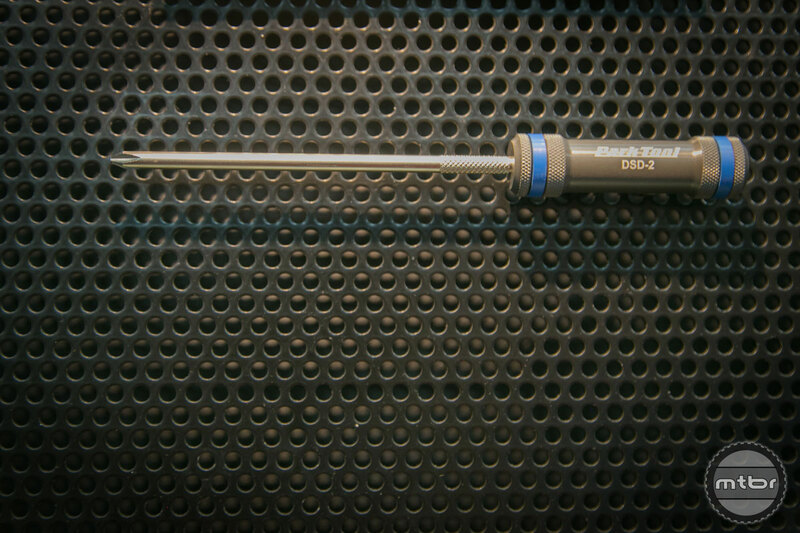 The new DSD screwdrivers are purpose built for adjusting derailleur limit screws. 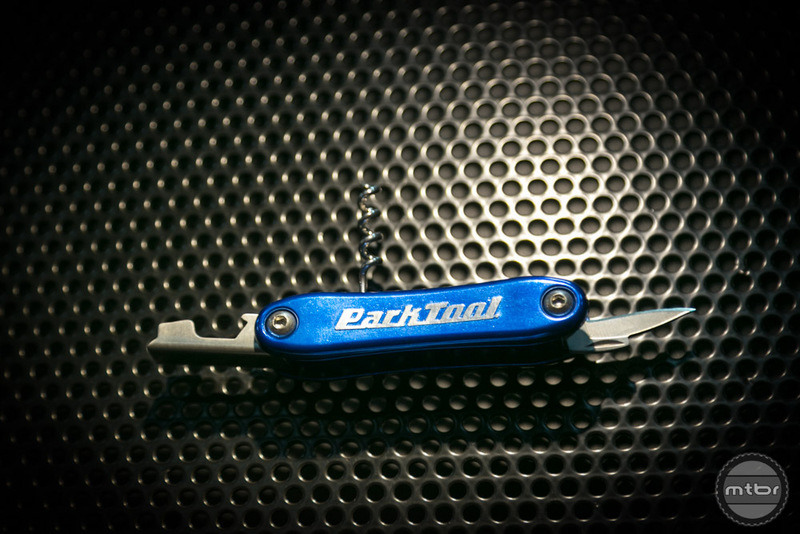 Park Tools now has derailleur specific screwdrivers. The DSD-2 uses a Philips head built to the JIS standard, which should prevent ham fisted mechanics from rounding out limit screws. The DSD-4 has a 5mm precision ground flat blade. Both screwdrivers feature an ergonomic CNC machined aluminum handle. Retail is $34. This plastic tool can be mounted on your workbench or work stand. To make reaching for tools easier, Park Tools has debuted a new Tool Caddy. Available in either table or repair versions, this plastic carrier has room for various screwdrivers, wrenches, and loose parts. Retail is $68. This bottle opener isn’t cheap, but it does look cool. Need yet another bottle opener? This new top popper from Park Tools replicates the look of a multi-tool, but combines a bottle opener, cork remover, and knife/foil cutter. The steel bits are all housed in an aluminum case. Retail is $52. Park’s new ratcheting wrench set is a great addition to any home mechanic’s work bench. One of our favorite workshop tools is the ratcheting wrench set. For years, we’ve been using a cheap set from Craftsman. Now, Park Tools has their own version. 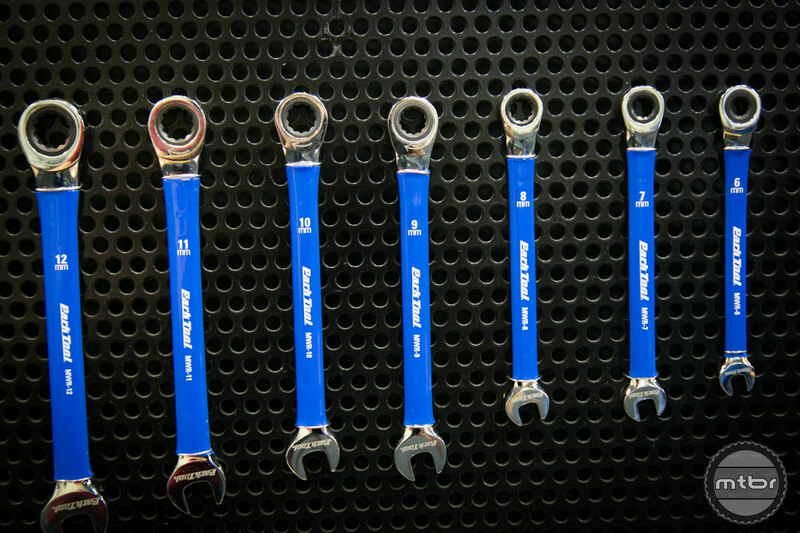 Their wrenches are forged from chrome vanadium steel, then chrome plated, polished, and wrapped in blue vinyl. The two-way ratcheting wrenches ship as a 6mm-17mm set. Retail is $150. 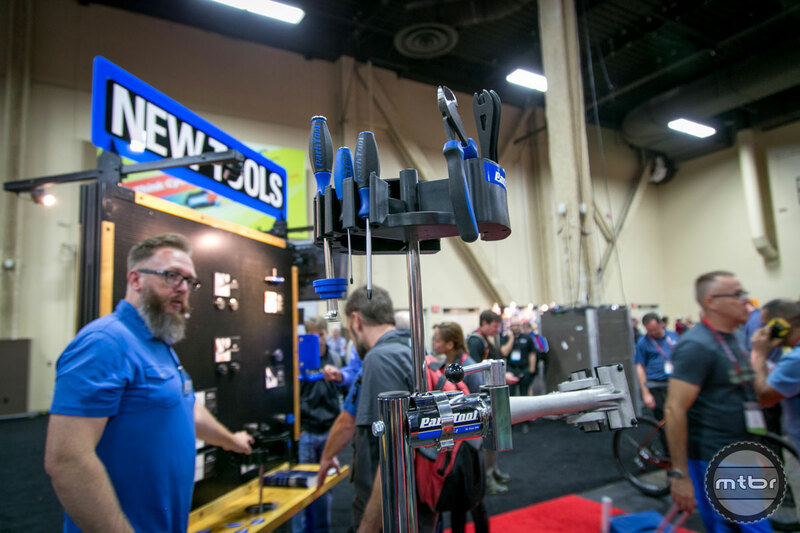 Park Tools is not selling wrenches individually, but that may change in the near future. This Prestacycle air tool is the ultimate luxury in tubeless tire setup. The Digital Prestaflator is the ultimate luxury in tire inflation. This tool mounts onto you standard air compressor and allows you to accurately inflate tires via a long through trigger. 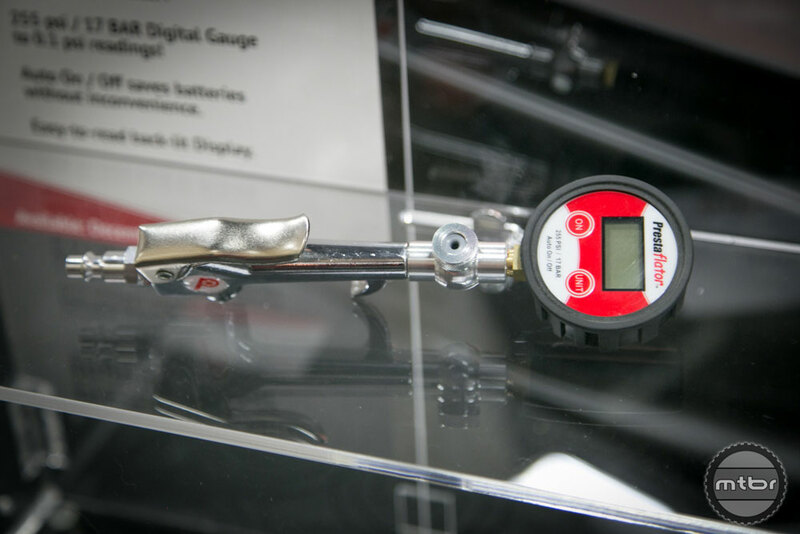 As you’re inflating, the integrated digital gauge gives you accurate readings. 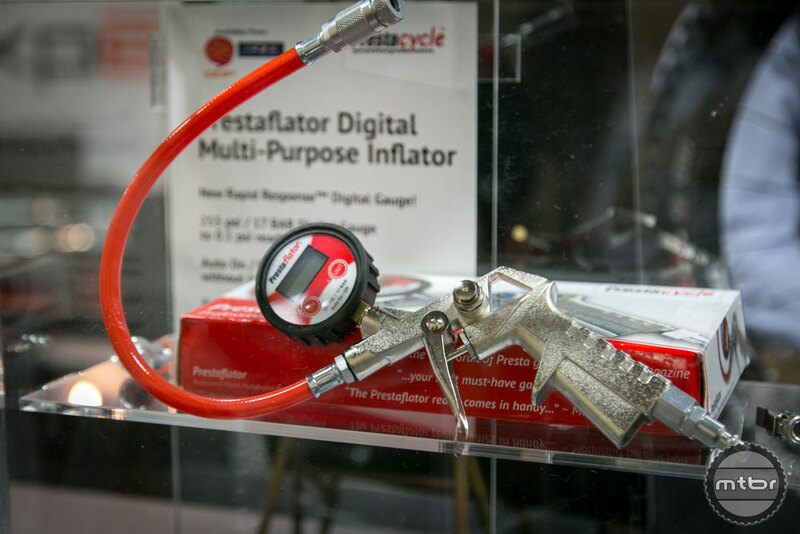 Prestacycle also offers a mini digital version of their tire inflator. Price is TBD, but we like that it’s compact enough to operate with only one hand. This multipurpose version includes a quick connect Presta head, as well as a Schrader head, angle head (for hard to reach spots), and a blower tip for cleaning. Retail is $80. You can pick up the original version, which features an analog gauge, for $50. For more info, visit www.prestacycle.com. The TorqRatchet accepts 14” bits. Used as a standard wrench, it can withstand 40Nm of force. Adjust your grip and the wrench works as a 2-10Nm torque wrench. Prestacycle breakthrough product was the original Prestaflator, but they’ve expanded the product line to include some nifty tools. Their newest is the TorqRatchet, which is a portable ratchet wrench with an integrated torque wrench on the end. You can hold the handle to operate it like a normal wrench, or reposition your grip to utilize the 2-10Nm torque measurement. If you’re curious how it works, catch the video above. Retail is TBD, but should be around $50-$70. They’re hoping to launch early next year. The Silca name is synonymous with high quality pumps. 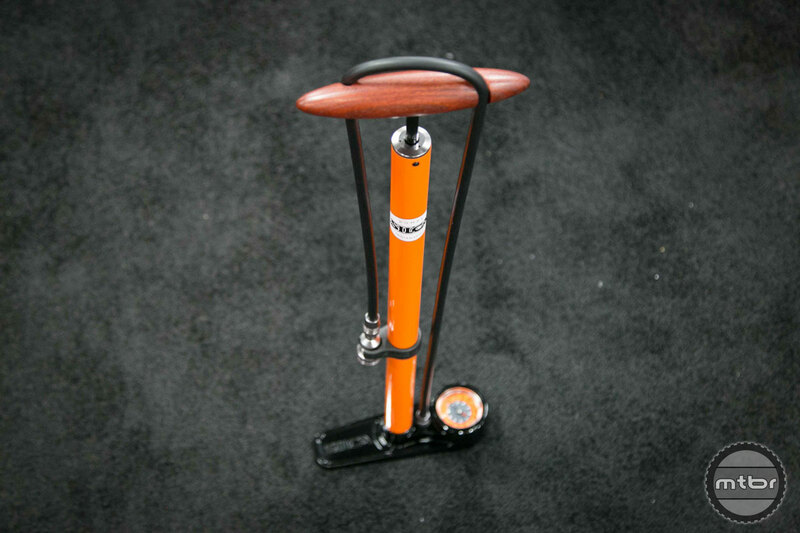 Silca began manufacturing the Pista bicycle pump in 1962. It was a mainstay for the brand until the 1990s, when it was discontinued. At Interbike, Silca debuted a new Pista pump that shares the same overall styling as the original. However, they’ve made some minor updates, like a higher precision gauge and addition reinforcements along the base. The Pista goes up to 220 PSI. Other updates include a gorgeous ash wood handle, upgraded chuck with Schrader compatibility, and a bleed port. The pump retails for $125. If you love this orange color, you should place your order ASAP. 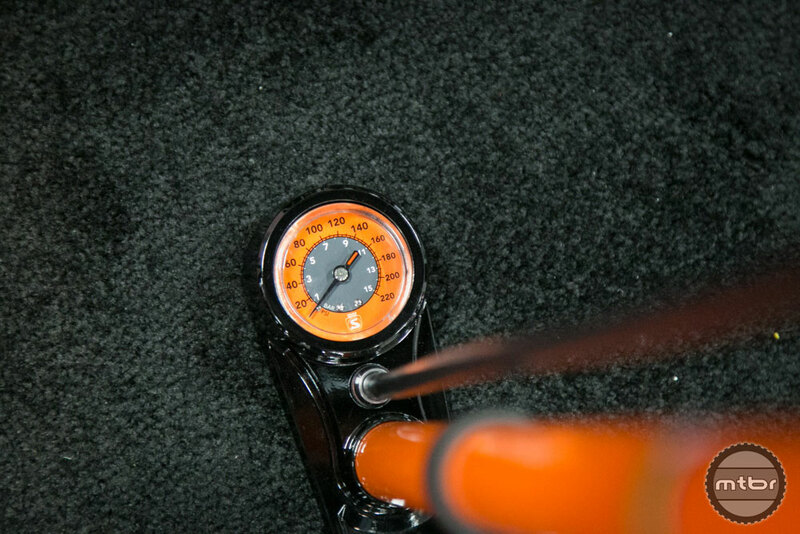 According to Silca, only the first 1000 pumps will be available in orange (an homage to the original). After the initial batch is gone, the bodies will be red. The Silca travel bag is beautifully designed to carry your pump safely, plus an array of additional tools and components. 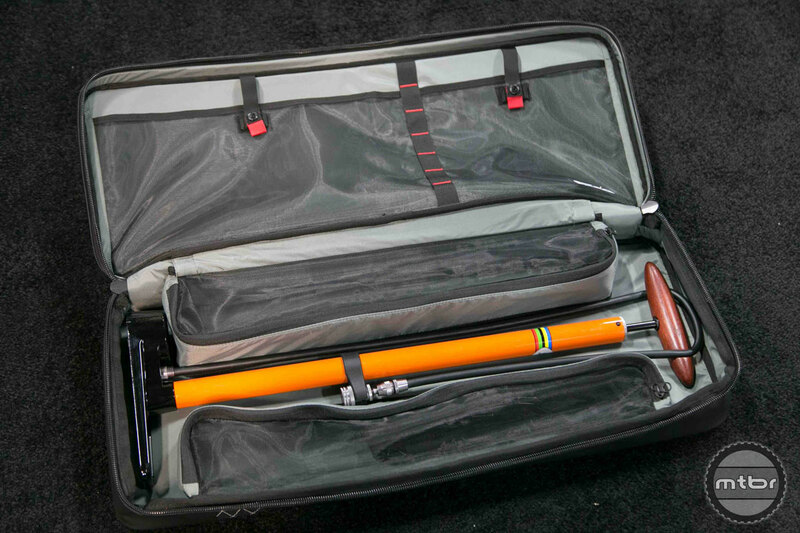 If you plan on traveling, Silca also offers the Pista Floor Pump with a custom travel bag. The bag is made from 600D nylon and canvas. Inside, there’s an EVA padded insert to securely hold the pump, plus additional storage compartments for tools, nutrition items, and other track side essentials. Retail for the pump and bag is $199.You can have the bag custom engraved with your name for an additional $40. For more info, visit silca.cc. 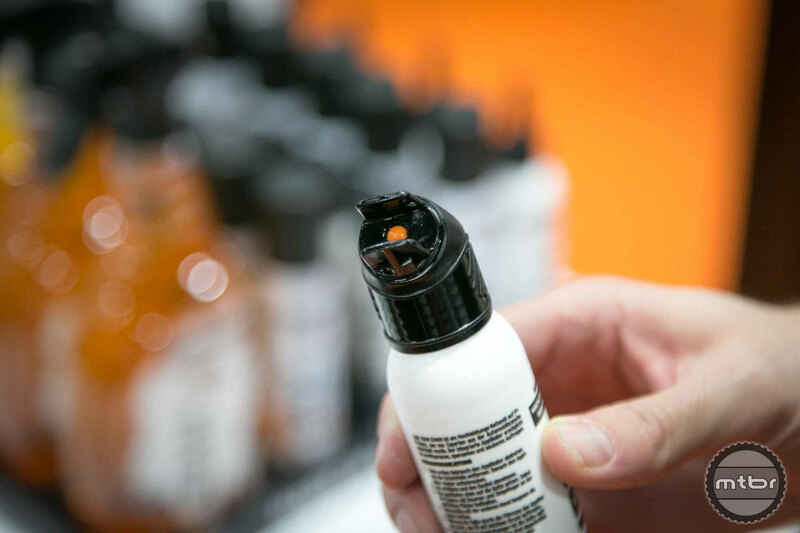 SKS now offers a full range of “bike liquids” to help clean and care for you rig. 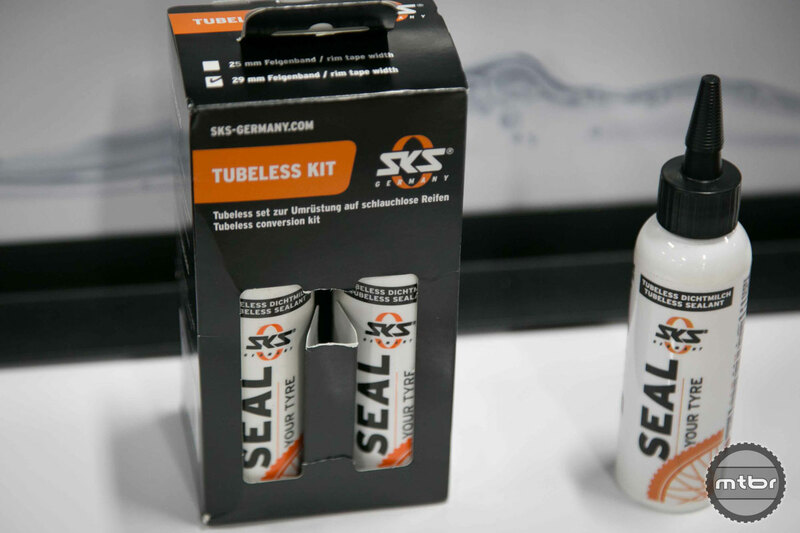 SKS is best known for their pumps, tools, and fenders, but the German company has recently expanded its product line to include new “clean and care” products. They now offer everything from bike wash, to frame protectant, and tire sealant. This unique applicator helps precisely apply lubricant to your chain. Our favorite product in the new range is their Lube Your Chain. It uses a PTFE based oil to prevent corrosion and form a protective film. The most unique feature is the applicator. It uses a plastic head with an embedded ball. As the chain rotates through the plastic guide, the ball moves to allows lubricant to drip down where needed. Retail is TBD. The entire range of SKS bike liquids should start shipping early next year. Learn more at www.sks-germany.com. 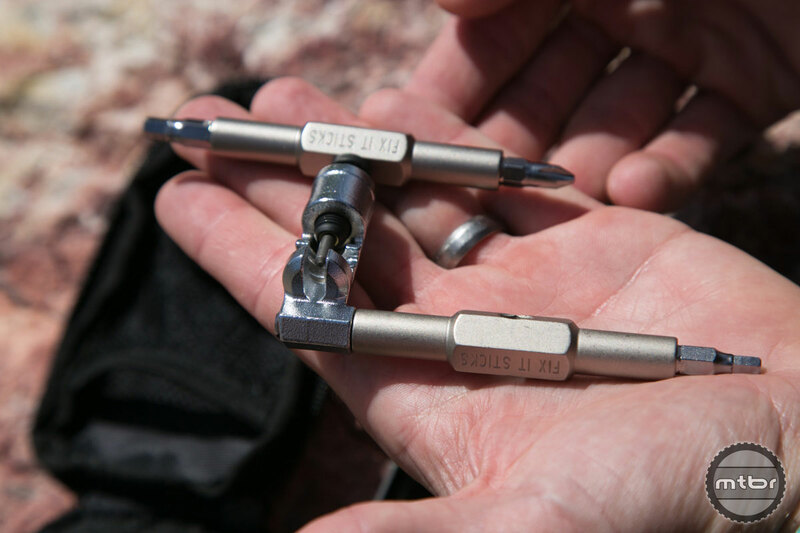 Travel smart and lighter with Wolf Tooth’s ingenious lightweight wrench. 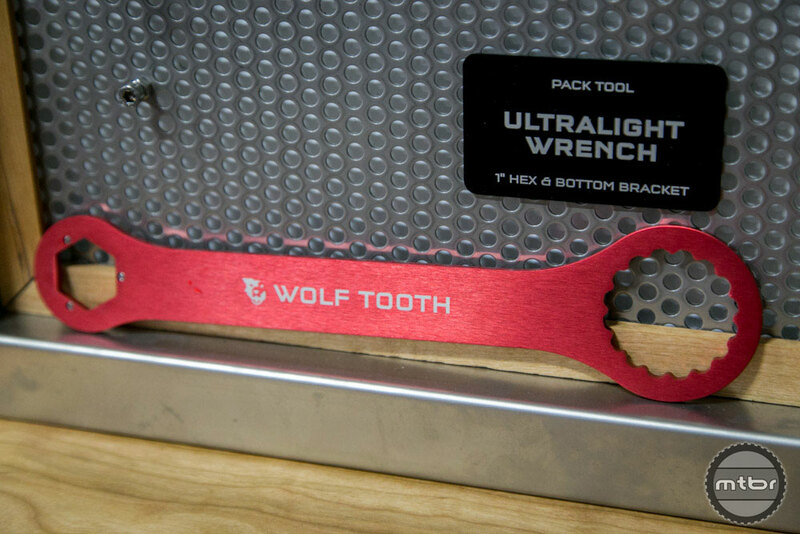 The Ultralight Wrench from Wolf Tooth features a standard bottom bracket on one end and a 1” magnetic hex on the other. The magnetic piece is special, because it holds tool bits securely, while still being easy to decouple. Some of the Ultralight sockets slated for release include a standard cassette tool, 16mm Allen (for Race Face cranks), chain whip, and more. The wrench retails for $33. The magnetic inserts will retail separately. They’ll retail for $19 a piece. To learn more, visit www.wolftoothcomponents.com. This article is part of Mtbr’s coverage of the 2017 Interbike trade show in Las Vegas. For more from Interbike CLICK HERE.